In an effort to keep me going with reducing the stash this year, I’ve joined a number of Ravelry groups. I’m sure there will be times that I can use all the encouragement I can get and I find that Ravelry groups can be really good for that! One group I’ve joined is Year of Stash Socks (aka YOSS). They are doing a “Slash & Smash Your Stash” challenge for 2012 this year. I’m not sure how many KAL’s I’ll join in on in that group as last year I think I dropped out of it because there weren’t many Knit-A-Longs (KAL’s) I was interested in and always had some other project I was working on instead. One of the KAL’s they’re doing this month is the Leg Warmer Socks. I have some stash yarn that would work well for these and I’m sure they’d be great to have around the house since I seem to always be freezing lately! I’m using 3 colors of Cascade 220 Superwash in white, red, and grey. 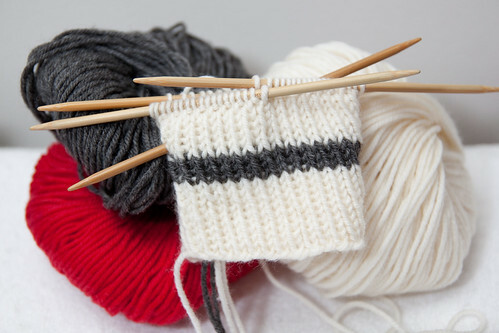 Initially I was going to do grey stripes in the leg of the sock, but after knitting one stripe, I didn’t really care for it so I decided I would knit the foot with grey and red stripes instead. Here’s a picture with the stripe in it. I’ve ripped back and removed it, but have knit back to about this point now. Another group I’ve joined is the 12 in 2012 group. This group isn’t project based (as in you have to knit a specific type of project), but can be any projects you want to knit. I’ve picked out 20 projects total and tagged them in my queue on Ravelry. Not sure I’ll get through all of them this year, but it’ll give me a decent list to pick from to get at LEAST 12 projects done from stash this year. I only put a few sock patterns that I wanted to start in the month of January on that list. I figure I’ll be knitting socks all year like I usually do, so I figured I’d keep that mostly separate from the 12 in 2012 projects. 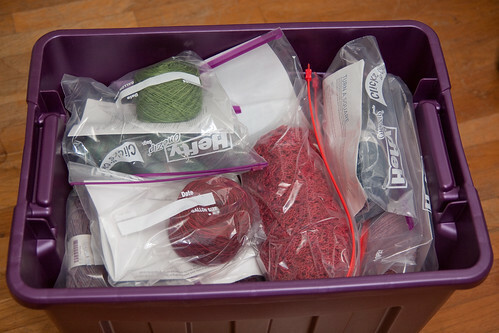 To help keep me organized and on track with knitting projects off this list, I took time to pull out all of the yarn from stash and bag it with the pattern (if I had the pattern already, there’s a few that I don’t have yet). I thought this would be a great way for me to just go to this bin and pull something out when I want to start a new project. No more project indecision! You may notice a sweater in there. It’s my February Lady Sweater. It no longer fits, but I really love the yarn I used. My plan is to reclaim the yarn and knit a Fitted February Lady Pullover with it as one of my projects for this year. I don’t know if I’ll end up counting it for the 12 in 2012 since it’s really reclaimed yarn and not something in stash that hasn’t been knit. Figured I’d throw it in there as a reminder that it’s something I want to do. I’m part of a few groups for socks on Ravelry: Year of Stash Socks (which I mentioned above), Solid Socks, Sock Knitters, and the big one Sock Knitters Anonymous (SKA). Solid Socks I’ve been part of for a while and I’ve been a member of SKA previously. It’s SUCH a busy group that I don’t really get too involved there most of the time, but occasionally I do like joining in the KAL’s. I figure between all of those groups, I’ll keep busy with KAL’s or other sock knitting during the year! I do have a few small sock goals: knit the Stained Glass Bubble Socks, knit socks from stash since I have a lot of sock yarn already, and knit at least two pairs of socks for my mom. I’m already on my way with a combination of goals: knitting from stash and knitting socks for my mom. 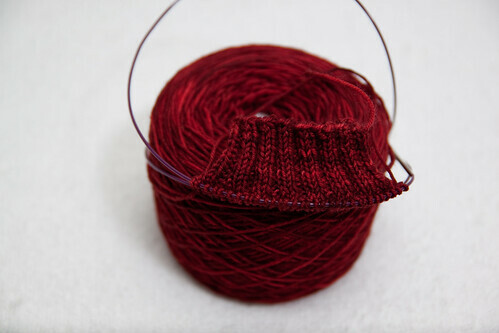 Monday I started a pair of Cadence Socks using Ogle Design Fiber Arts in Ruby which I picked up at the Hoosier Hills Fiber Festival in 2010. I love your bin of projects. I’m considering doing one of my own but I know that I probably would get a mental block that way. Thinking about knitting some legwarmers for me to wear to bed now since my PJ pants always pull themselves up and my ankles get cold.